I went camping last weekend with a group of friends/acquaintances and someone brought one of these things. I was so impressed with the quality of the sound and the battery life (rechargable from a microUSB port) that I bought two of these. They just arrived moments ago. They're awesome. I can pair them up for stereo sound and put one in the bathroom and one in the kitchen or whatever fits my needs. Great for my Nexus 7 (2013) tablet, because even though it has stereo sound already, the speakers aren't great quality and sound a bit "tinny". These Jam Plus speakers are surprisingly good, considering how small they are. I can feel the bass when I hold them in my hand. Time for another coffee gadget..
Back on this post in the gadget thread, superboyac mentioned the AeroPress, though he never posted a link to information about it. I've been using it for a while now and I like it -- it's sort of fun, and it cleans up fairly well, and its good for if you only have an occasional cup of coffee. Now the next logical step after getting one of those fellas is to grind your own beans (the home-roasters can talk about that process -- i won't be going there). As for grinding -- the serious coffee folks will tell you that the more expensive "burr" grinders do a better job of grinding than the cheaper blade grinders. Personally, i'm not sure i really buy it. The burr grinders certainly produce more consistent sized grinds and may not leave you with some of the fine particles that the blade grinders will, but i'm not convinced that would be such a big deal. However, as someone who has a great appreciation for small gadgets that don't take up much room -- the idea of a big burr grinder (and they are all relatively big) is aesthetically offensive. Which brings us to these little hand (burr) grinders, which take some effort but can pretty quickly grind enough beans for a single cup of coffee. Like I said I don't care much about burr vs blade, but what I like is that the coffee gets ground right before use and doesn't sit around for weeks, and it takes up almost no space, and cleans up super easy. Just dumps the ground from the grinder into the Aeropress (or whatever) and you are done. If you don't mind doing a little work before each cup of coffee, this is a fairly nice combo with minimal counter space requirements and minimal cleanup. There are better ones out there, but it does a great job. For size, I just have it on a high shelf so it's out of the way. As for burr vs. blade, I had a blade grinder in the past, but I much prefer the burr grinder. The blade grinder was sporadic, inconsistent, and relatively time consuming comparatively as you'd need to grind for longer to get a decent fineness. Also, it couldn't handle a lot, so you'd end up doing a couple batches if you wanted to grind more than a cup. I'd have no clue about taste differences - the only thing I can see there is the grind size. My particular model needs the base to be cleaned of grounds every so often. It's a tad messy, but nothing serious, and not a worry for anyone that isn't obsessive compulsive about being tidy. I was looking-at/listening-to a cube speaker at a friends a while back. I was amazed by the sound coming out of the thing. It was around 3.5" cubed. (I'll have to get onto to them and ask about the brand/model - I see lots of that type of speaker on sale). It did have the advantage** that one could put a mini SD card in it - it would then just shuffle or play random tracks though. ** advantage to me at any rate: I'm not a smartphone user and never use portable music players - I get 'ear clausterphobia' when wearing earphones for any length of time. If you like a bit of sweetness to take away some of the bitter taste of coffee, instead of sugar try malt extract. It has a distinct flavour, but nicely removes that bitter edge like sugar. Also, it's full of vitamin B.
I realized a problem with these speakers: They won't work well for helping my tablet's speakers when watching a movie or videos because the sound is slightly delayed. I'm sure this is more a problem with bluetooth/wireless speakers in general and not really a complaint specific to these particular speakers. But I didn't realize at the time that the audio and video wouldn't be synced, so I guess they're mostly only good for listening to music or other audio that doesn't have accompanying video. That's kind of a bummer. Oh well, they work well bringing my music into my car with me, since my car only has a non-working cassette player and I can't stand listening to the radio (if it even works in my car...). I realized a problem with these speakers: They won't work well for helping my tablet's speakers when watching a movie or videos because the sound is slightly delayed. When you have two of them playing stereo, can you connect them up directly (to the one socket)? Maybe if I had a special splitter cable thingy that would take an output and split it into left and right audio channels I could do it. But that kind of defeats the purpose of the nice wireless speaker setup. Fast Tech is a place I found recently. Quality seems good so far for the few items I ordered. Picked up a pack of Gillette Fusion razor blade cartridges really cheap. Ships from China, so, depending on where you are in the world, it could take a few weeks to get your stuff. And rumor is that this is about "knockoffs". So take some care....full shopping. Personally I think it's a back door to some name brand items already made in China. It far exceeds what I was using before (which was really no good). That looks great. I have a similar set but without the extension bars -- which look very useful. For those that are curious, the second extension bar there is bendable, which would let you access some otherwise inaccessible areas. For those that are curious, the second extension bar there is bendable, which would let you access some otherwise inaccessible areas. I've used that feature once so far and for that case it worked ok. Seems to work pretty good and he is having a lot of fun with it. And once the zucchini is steamed, it has a very similar texture to pasta. He's a very happy guy! 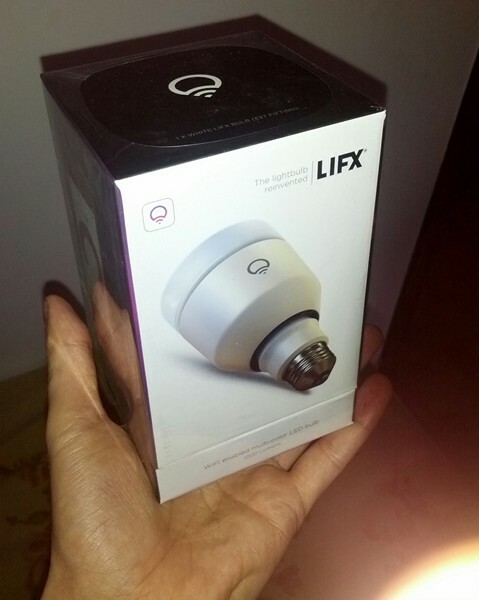 I got myself a LIFX! Here's a link to the LIFX website. It's a RGB+W LED lightbulb with WiFi connection. It's very bright at up to 1000 lumens, and can light up with basically any color, or white in various temperatures. In a multibulbs setup, a LIFX connect to the home network and then works as a gateway to a mesh network with all the other bulbs. I believe the bulb run on Contiki. So it's basically a network controlled light, and so the applications can be endless: from mood lighting to visual notification, wakeup alerts, etc. I become intrigued with LIFX back when they run their (very successful) Kickstarter campaign, and now that it's generally available I just had to get one to play a bit. Note that, in the mean time, other similar systems have become available. There's for example the Philips Hue line: it's the more complete & supported out of the box, and include bulbs, LED strips, accent lights / desk lamps. Another one is distributed under various brands: LimitlessLED, MiLight, EasyBulb, etc. : it's probably the one with the better price/features ratio. Both these other systems needs and hub to connected to the home network, that in turn communicate with the lights via other RF system (ZigBee for the Philips, and probably the other also). Well it says it's for blackheads but i wouldn't use it for that; but the process is the same for pimples. you put the hole over the pimple with the round side down and press -- it basically applies lots of pressure in a fairly benign way. Essentially: If you are compelled to pop a pimple, this is a better way to do it than trying to use your fingers. ^ had a similar one once, didnt work well for blackheads on the nose: needs bone structure to press against, otherwise it didnt work for me, so I gave up on it. What are you going to build, ewemoa? Just a flash of color with every new Bitcoin transaction; sort of a Blockchain activity monitor / visualization. Works well, cheap, and you can program buttons to turn off individual lights or combinations (for example one button to turn all on or off). Very satisfied.